Low graphics|Help If you would like to get into rowing and are not sure where to start, let us help. 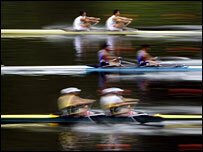 The Amateur Rowing Association is the governing body for the sport of rowing in Great Britain. The ARA is responsible for the organisation and development of the sport. There are 11 regional divisions of the ARA in England. Megan Hogan Co. Durham, DL16 6TN. Paul Fenoulhet, 3 Wyke Lane, Farndon, Newark, Notts, NG24 3SP. Christopher Anton, 27 Haughton Road, Handsworth, Birmingham, B20 3LE. Brian Foster 53 Purbeck Close, Bedford. MK41 9DX. T.0870 1644 783. The National Rowing Academy at Strathclyde Park, Motherwell, was opened on 7 June 2002 and has great facilities. Welsh Amateur Rowing Association The governing body of rowing and sculling in Wales.